New research suggest tech companies are focusing more on voice recognition and other means than text interaction. For more than 20 years, internet’s search function has remained virtually unchanged. We’re still used to simply typing the query in search bar and presto! While this might sound like the simplest thing to most readers, typing your query and using a keyboard is still rocket science to a majority of people across the globe due to poor literacy. Since consumer technology doesn’t discriminate users based on education, it certainly seems that manufacturers will look for other options and applications that allow interaction without keyboards. According to Wall Street Journal, more and more companies are adopting the use of features such as voice recognition and speech to make their devices more interactive. WHEN CAN I STOP USING MY KEYBOARD? As the above is more easier said than done, experts really doubt whether keyboards will actually ever become obsolete; at least not in the next 15-20 years. Voice recognition and text-to-speech are certainly gaining more ground in terms of functionality and practicality. But companies can’t still ignore the first billion internet users who still want to conduct searches the old fashioned way. Therefore one can also safely say that this change could be similar to automatic transmission in cars that have made driving a car much easier, but people still love driving a stick. WILL SPEECH RECOGNITION EVER FULLY REPLACE TYPING? While both speech and image recognition technology have taken mainstage among tech manufacturers, it is still not as perfect. Since machine learning is still yet to outmatch human senses, Speech recognition could take decades before it can actually make a mark. As there will always be need of some form of private input, Voice recognition will play a more supplementary role rather than complete replace text input. YouTube app now features a chat service to allow users to discuss and share videos without leaving their website. WHY WOULD ANYONE CHAT ON YOUTUBE? Youtube videos are usually shared on other social network platforms such as Facebook, Twitter or Whatsapp, wouldn’t it be convenient if we were able to do it directly on youtube? This is the exact question that Youtube officials are trying to answer through their new chat service. This mobile-only feature allows users to directly share videos with their contacts within the Youtube app. Conversations are kept totally private and prevents users from navigating to other portals. 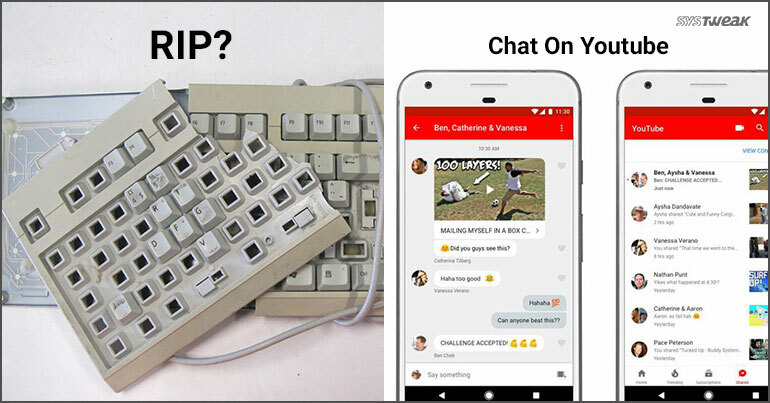 CAN THIS BECOME A VIABLE CHAT SERVICE? Although a lot of experts have claimed that this new service is to make video sharing better, we cannot deny that it might end up competing with the market giants. Youtube officials have called it a ‘sharing feature’ which is far from being apt. This chat interface not only shares videos, but can be used to discuss anything with your contacts. Moreover it also supports sharing video links from other websites such as Vimeo, Dailymotion and Facebook. COULD THIS OUST GOOGLE’S OWN CHAT APP? Some would hope for a major clash between Youtube chat and other apps such as FB Messenger and Whatsapp. However, this could also spell doom for Google’s ambitious Chat app ‘Allo’. Since there are definitely more Youtube app users than Allo, this may become more favored as compared to any other Google Chat app.